Although writer Sid Jacobson and artist Ernie Colon are old pros in the comic-book business, they're doing what could be the most meaningful work of their life at the moment. In 2006, they published a graphic adaptation of the government's commissioned 9/11 report, and now they've completed a kind of sequel that's altogether more impressive and comprehensive. Like their previous book, Jacobson and Colon are calling what they've done "graphic journalism," marrying words and pictures to impart information. It's pretty dense with data, and the only narrative imparted is the arbitrary one of time line. It's also not about the war in Iraq, except in the way the current White House conflated terrorism with Saddam Hussein in order to create a winnable conflict. 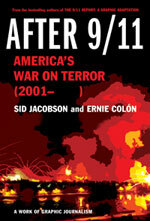 "AFTER 9/11: AMERICA'S WAR ON TERROR (2001- )"
Both men claim to have reached some conclusions after their exhaustive research. These aren't that obvious, except in the way they order their facts -- allowing the reader to, naturally, come to the same conclusions. Still, even the most objective observer remembers the Bush administration's rush to open hostilities at the expense of fact-checking and basic diplomacy. The art by Colon is fascinatingly detailed, and you can tell when he got tired of limning mug shots and got creative with Photoshop. Jacobson's script isn't so much a zenith of writing ability as it is a masterful example of editing. Even so, the sheer mass of facts is dense and numbing. Exciting it's not. But sobering and rueful, it is. 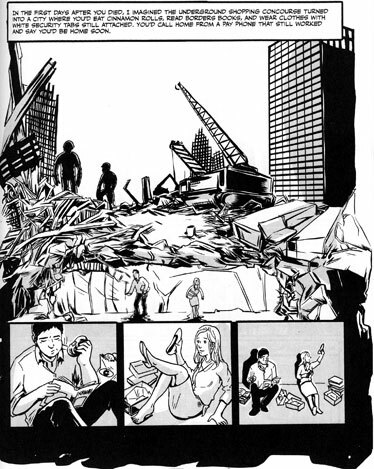 A page from the graphic novel "American Widow." Torres brings to life the agony of being a "9/11 widow" in this thoughtful collaboration with illustrator Choi. The death of her beloved husband puts Torres in the hellacious situation of not only dealing with her loss, but also trying to put her life together again with the supposed help of charitable and social service organizations, as well as being 7-and-a-half-months pregnant. While Torres collaborated carefully with Choi in conveying her heart-rending story as a graphic novel -- her clean and uncluttered work complements Torres' prose to perfection -- there are two chapters in the book, in particular, that stand out. One eloquently tells of the day of her baby's birth with her heart and soul still grieving the loss of her husband, and the other both tells and shows how, one night in February 2002, Torres acutely felt her loved one's absence. When read in one sitting, "American Widow" makes for a moving and inspirational experience.